Now about that Paris climate summit that is still scheduled to happen starting next 30 November . . . Wait now, don’t nod off! I realize that coverage of such UN climate summits is supposed to intrude into our consciousness only when they are actually going on, and even then to confine themselves to newspapers’ back-pages, to some link way down at the bottom of the homepage. The idea to let countries themselves tell how much they will do [i.e. towards acting againt climate change] was thought up to prevent the same sort of fiasco as that which afflicted the climate summit in Copenhagen in 2009. When all the world’s leaders gather in Paris in December, in this way they will not argue about the amount of CO2 reduction – instead they can concentrate on other difficult questions such as financing and control mechanisms. Sounds like a smart idea, although already the widely varying commitment among countries to this new set of rules has to be a little disheartening. All countries in principle have to send in such a [national] plan before 1 April. In practice it is expected that only a smaller number of lands, mostly from among the world’s richest, will live up to that deadline. The other countries’ plans will be sent later, some even around the final deadline of 30 September. But let’s shift our focus here back to the good news – Switzerland! 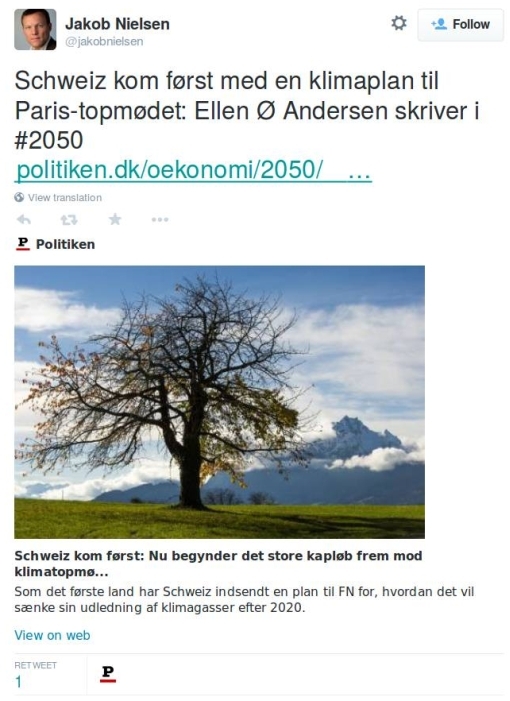 Not only have the Swiss already sent in their plan – the first country to do so – but it seems mighty impressive: the Swiss want to halve their CO2 emissions from what was their 1990 level by 2030. This is even more than what it is anticipated will be proposed in a collective plan that the EU will draw up and submit on behalf of all its 28 member-states. Then again: Switzerland is in a particularly favorable position to be able to set such a goal. It is a very mountainous country, of course, which means quite a lot of clean hydroelectric power is available. It also generates 36% of its power via nuclear plants, and apparently even boasts a culture in which storing long-term nuclear waste is considered a privilege which many local jurisdictions are willing to compete for.